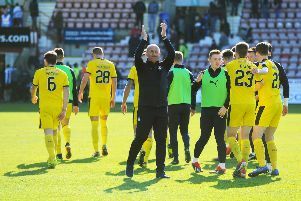 Fraserburgh gave last season’s cup finalists a scare in the Scottish Cup, but Falkirk ultimately saw off the Highland League side. An early goal from Lee Miller did little to settle the nerves and a second-half equaliser spurred Falkirk into action at a rain-lashed Falkirk Stadium. Miller completed his hat-trick after a header from captain Will Vaulks ensured the Bairns would be in action on January’s cup date. 28-11-2015. Picture Michael Gillen. FALKIRK. Falkirk Stadium. William Hill Scottish Cup third round. Falkirk FC v Fraserburgh FC. Goal Lee Miller 18. The Bairns made light work of the Broch ion the first half yet only had Miller’s header to show for it after an inspired 45 minutes from visiting keeper Joe Barbour. He could not, however, hold Miller’s header when the striker stepped ahead of team-mate Peter Grant to head the Bairns ahead at Blair Alston’s corner. A string of brave blocks and good saves kept the score down and gave the Broch hope though they had fortune on their side when a cluster of defenders scrambled the ball away from the line, though Craig Sibbald’s efforts both seemed - from the press box vantage point - to have crossed the line. The Broch had done similarly in the Bairns first attack which turned into a scramble in the area but none of Miller, Baird, Sibbald or Alston could find the net with Barbour defying the latter. So it was a slender advantage for the Bairns at the restart in monsoon conditions but within 15 minutes the Highland League side had threatened more than in the entire first half. Their persistence paid off when John Chalmers’ ball over the top on 67 minutes fell into the path of Mark Lawrence and he slid in the equaliser despite Alex Tokarczyk saving his first attempt. That spurred the Bairns into action and Vaulks’ header three minutes later restored the lead before Miller beat the offside trap to tap in and calm nerves in The Falkirk Stadium and then sealed his personal hat-trick by knocking in O’Hara’s driven cross. It was a horrible day for football, but it may have more significance in giving young Tony Gallacher his career milestone debut ten minutes from time with hopes high for the left-back among the Bairns backroom team.